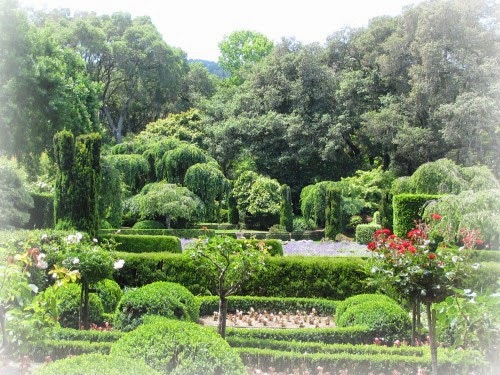 The dazzling gardens at Filoli, a country estate in Woodside, California are a stunning reminder of the beauty and variety of formal garden design during the early 20th century. Filoli is an historic site of the National Trust for Historic Preservation, and features a lovely Georgian style estate home with extensive gardens and plant collections. Although early spring at Filoli is the most celebrated season for viewing, our recent trip still proved to be filled with an abundance of beautiful blooms. 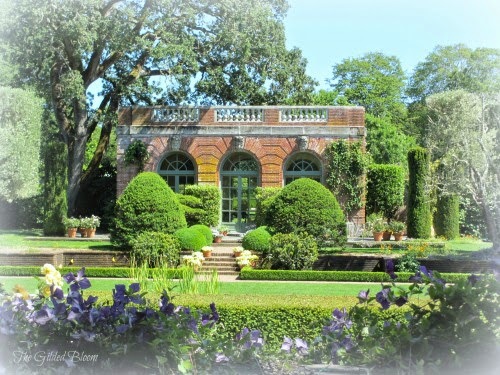 Here the Georgian style Garden House bears witness to the emphasis on symmetry found in architecture and design at Filoli. This greenhouse structure is filled with exotic plants that thrive indoors like orchids and ferns. 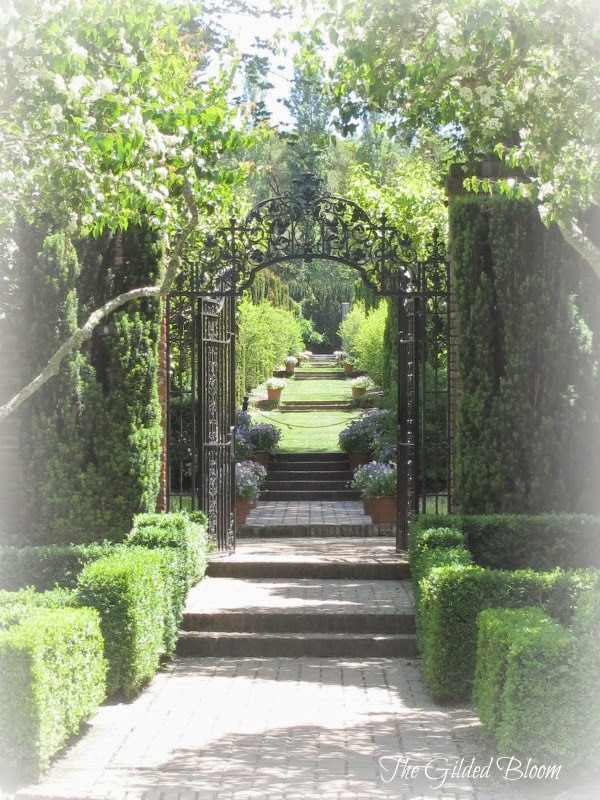 The majesty of the gardens at Filoli is reflected in the formal style and exquisite use of space. A layered natural landscape surrounding the estate is incorporated into the overall scheme of the gardens presenting a beautiful fusion of nature and design. The rose garden was in robust bloom when we visited. 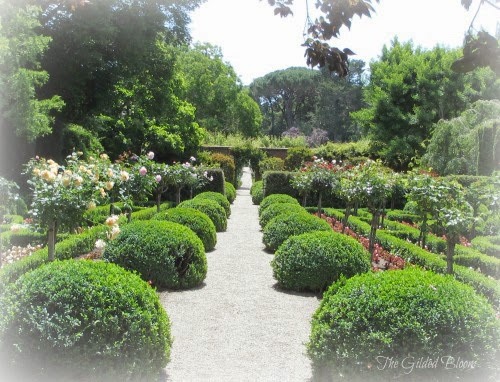 The corridors of roses lined with boxwood reflect the English Renaissance style of garden design featured in this part of the estate. 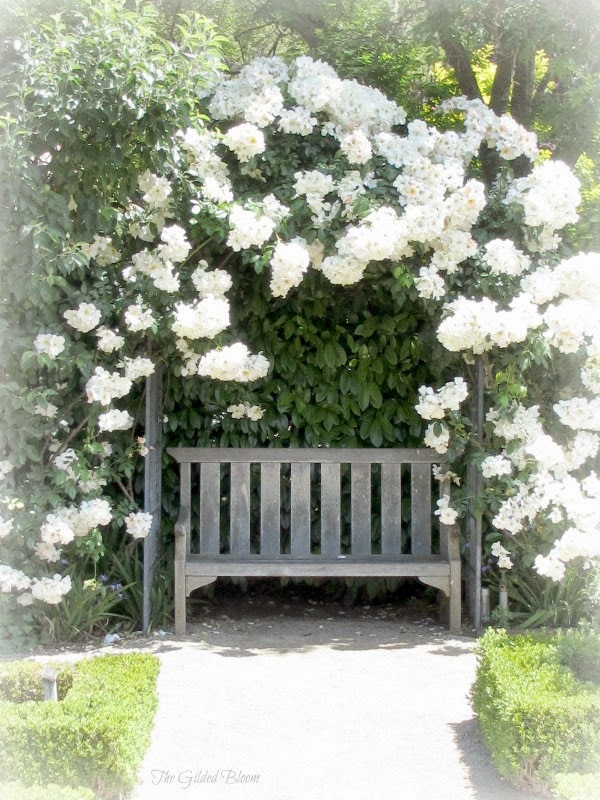 Benches encased by climbing roses are functional focal points in the garden. 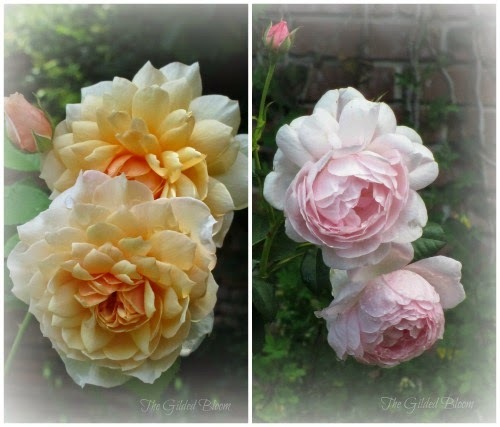 They provide both beauty and rest for those who want to sit down and enjoy the sweet scent of the surrounding roses. 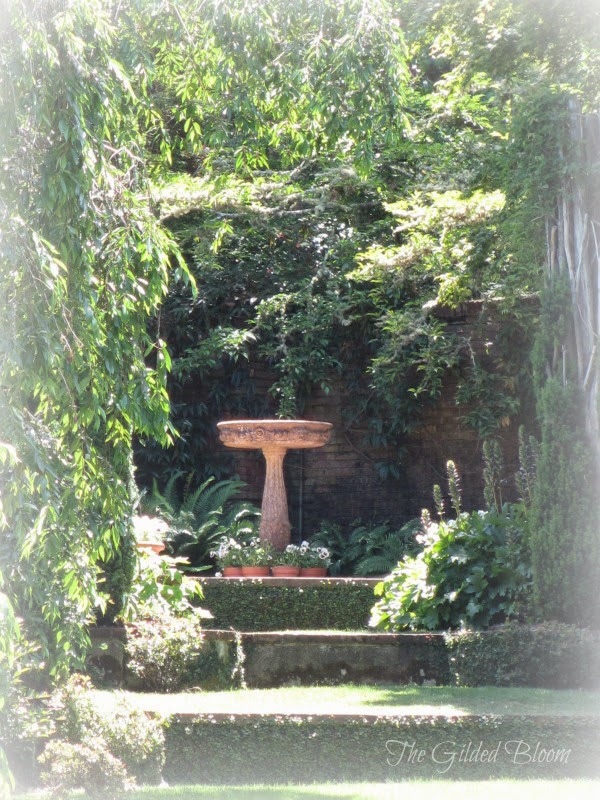 Elegant garden views like that of the birdbath shown below highlight the structural beauty of the garden. 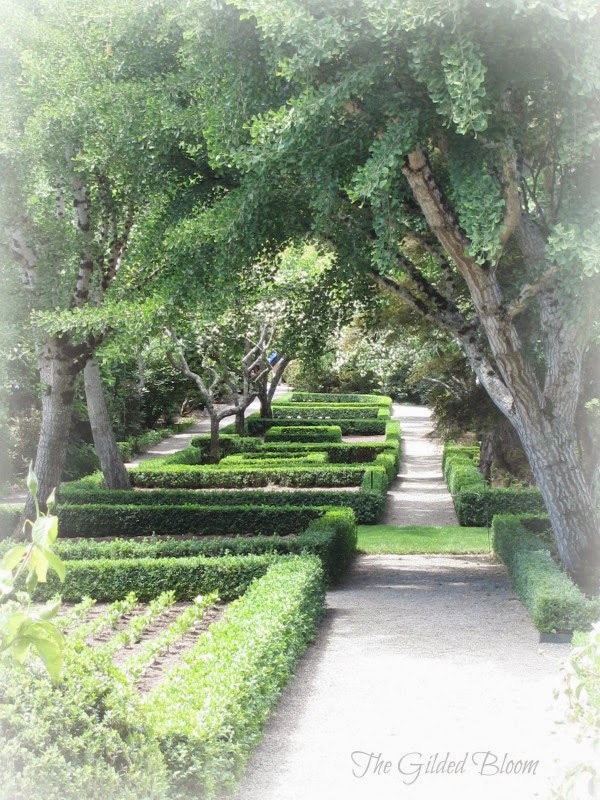 Trees create a canopy over a boxwood lined pathway showing the garden's geometric organization and creating shade for wanderers. Dramatic entrances frame the garden pathways and emphasize the graceful formality of the overall design. Intricate ironwork gates along with vine-covered brick walls seen throughout the estate add another elegant touch to the garden's design. 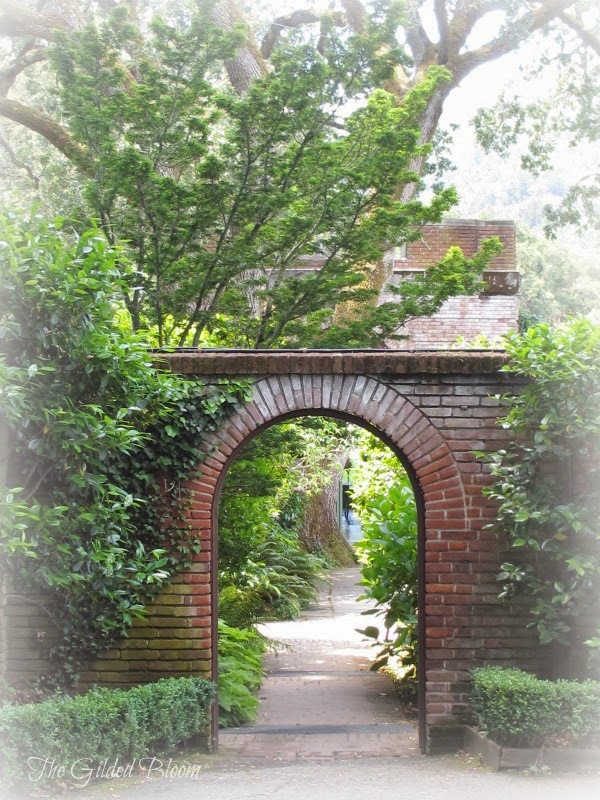 For more information about the gardens at Filoli please visit the official website at www.filoli.org. The Gilded Bloom is now on Facebook, Twitter, Pinterest and Instagram. For more floral inspired ideas and updates, please connect with me on these networks. You can also follow The Gilded Bloom on Bloglovin' or via email using the subscription box near the top of this page. Hope to see you there! Beautiful photos!! Filoli is such a special place and you really captured how magical it is. Thank you, Georgianna. We really enjoyed our visit. The beautiful gardens are overwhelming as there is so much to photograph!